The first stop of my West Coast adventure was Portland, Oregon. I’ve wanted to see Oregon for the longest time. Partly because I always considered working for Nike a dream job and their HQ is in Beaverton, but also because of how beautiful it is. I knew I needed to see it first and check out the area before I was serious about applying and uprooting my East Coast life, so I planned to start there and then work my way down to LA. This was a big deal, for many reasons. Flying solo across the country would be number 1. Anyone who knows me knows my fear of flying, but I knew it needed to be done. It was going to take a lot more than a 6 hour airplane ride to scare me after what I’d just been through. So I manned up, downloaded Stranger Things Season 2 to watch for a second time, and said let’s do this. My parents dropped me off at the airport (yes, my mom had tears in her eyes) and off I went. Someone must have pulled some strings up there because I boarded the plane and there wasn’t a soul around me. I had the entire row, the row in front and in back of me, empty. I definitely thought it was too good to be true, but I told myself to sit back and relax, and relax I did. The flight was smooth, spacious and easy. When we landed in PDX, I had tears in my eyes, I had made it and it wasn’t scary at all. I’d conquered fear #1. The first thing I did was snap a pic of the famous #pdxcarpet (if you know, you know) then picked up a Blue Star donut (passionfruit cocoa nib) for my cab ride. Once downtown, I checked into Kimpton Hotel Monaco and headed out for the day with my friend Hannah. We caught up on life over brunch at her favorite spot, Junior’s. Post brunch, she gave me a tour of Nike and then shopped a bit at the Nike Employee Store (yes, I was dying). Hotel Monaco was one of my favorite parts of Portland. Every single hotel employee was the kindest, most helpful person. I lived for the quirky decor and felt safe my entire stay. It was within walking distance of many places I explored and led me to find some pretty sweet spots. Whenever I go anywhere, I look to see if there's a Kimpton hotel in the area. It's my go to hotel partner and am never disappointed with my stay. If you haven't checked them out yet, you must. 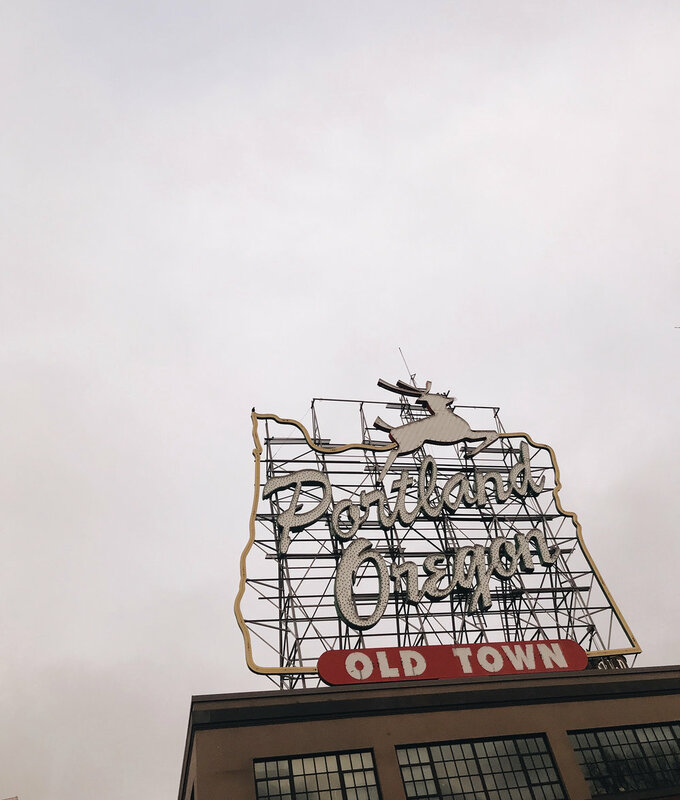 The rest of my time spent in downtown Portland was a combination of eating whatever I wanted, whenever I wanted and walking mile after mile to acquaint myself with different neighborhoods. Highlights include the most delicious amaretto sour tucked away at Pepe Le Moko and tipsy finds at Wildfang, a boutique fit for any cool-guy or girl millennial who watches Golden Girls re-runs like it’s their job. I wandered through Powell’s books and devoured a flight of Salt and Straw’s latest ice cream flavors (think the Oddfellows of the West). My absolute favorite moments in Portland were stumbling across a vintage New York City Marathon T-shirt at House of Vintage and sipping on secret whiskey concoctions at The Multnomah Whiskey Library, a speakeasy known to many locals. If you go, you MUST get the fried cauliflower, it was one of the best things I ate in Portland. Other major highlights included visiting Nike and running around HQ. I crossed off a major bucket list item when I hit the track for a few laps and toured campus. I can’t thank my friend Hannah enough for introducing me to the culture and allowing me the opportunity to see what it’s all about. Running where so many greats have ran before me was magical and exhilarating. Getting acquainted with the city side of Oregon was super interesting, but I was anxious to finally get to the Oregon coast and eventually get down to Crater Lake. This continent has an infinite amount to explore and I was lucky enough to visit some our nations coveted treasures along my West Coast journey. Next stops: Cannon Beach and Crater Lake.